Almost all social media cites use their claim of neutrality to defend their inaction in terms of accountability and morality. These calls for stronger ethics and accountability have been brought about as we have seen the shocking consequences when social media is used for the wrong reasons. The first example of this occurred during the election, when Russian hackers placed propaganda all over Facebook in order to disrupt democracy. 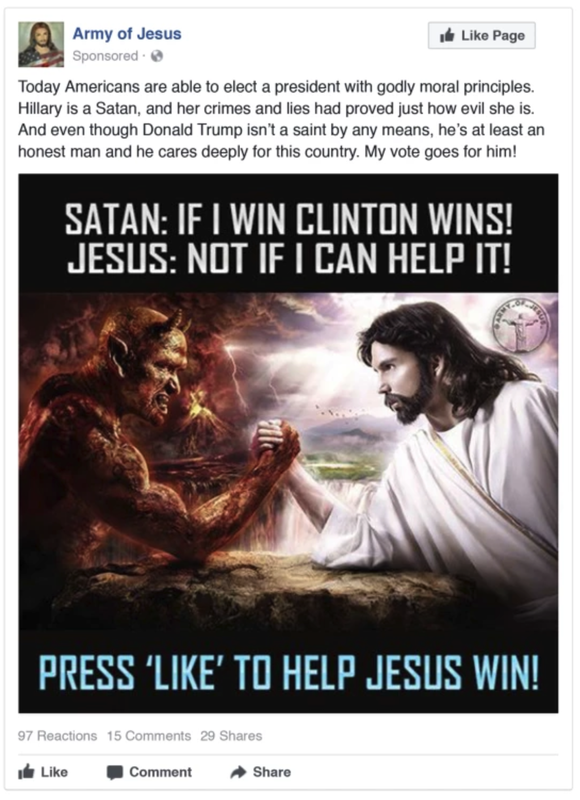 This propaganda ended up swaying the election in Donald Trump’s favor, and it was in part because of posts like the one below. This post and numerous others, some that organized rallies that weren’t actually real, created two sides, which were extremely opposed to each other and the idea of the other side’s candidate winning. When we went on the website in class this was very apparent, as many of the posts were leaning to the far extreme of either side. The solution, many believe, is for the social media cites to monitor their content and limit trolling and the spread of harmful content. This is when social media cites have used the claim of neutrality to defend them not doing anything about the problem. If the social media cites do intervene they lose their claim of neutrality and the fact that they promote free speech. Since free speech is what the United States is founded on and one of the reasons social media is so popular, social media cites could lose the popularity they have now. On the other hand, if they don’t do anything the continuance of propaganda, misinformation, and trolling will proliferate to new heights. There is not a clear solution to this difficult problem, but it seems as if many social media cites are choosing inaction over action in order to protect their user’s free speech.